As a young boy growing up in the Methodist church, I have fond memories of a church that taught me so many things. The members of my church greeted me with a smile every Sunday, asked how I was doing, and genuinely cared about the activities in my life. As I grew up, I became more active within the church. I took part in many mission-based trips, I became one of the worship leaders with the worship team, I spent hours every week in bible studies, small groups, and in church. The people whom surrounded me in the church were the people who would play a large part in molding me into the man I have become today. However, this journey in my faith was not all sunshine and rainbows. As I grew older I began to realize certain things that made me different than all the other ‘good Christian kids’ I was growing up with. I went to a very dark place and was convinced that I had no place in Christianity because of one thing: I was gay. I continued to struggle with this for quite some time, finding the balance of identities between being a Christian and being gay. I can distinctly remember being at a mission trip in Las Vegas, with my youth group in 2013 listening to a sermon on one of the last nights of our trip. The message was about everyone having things about themselves that they don’t like and want to change, but that God loves us just the way we are. The pastor then asked us to take some time to think about if we could change one thing about ourselves, what would it be. This memory is one that is very vivid to me. I remember sitting with my head in my hands praying and sobbing because the only thing I wanted was to be ‘normal’ just like everyone else there. I hated myself for being gay and that was the only thing I wanted to change about myself, and the one thing I couldn’t. I remember repeating, “Why does it have to be me? Why do I have to be gay?” I sat in that sanctuary for what felt like hours, but I wasn’t sitting there alone. I was surrounded by members of my church, both leaders and peers, whom expressed their love for me, whom showed compassion for me, whom showed support for me, and told me that God loves me just the way I am, and God certainly doesn’t make mistakes. I remember this so vividly because I finally felt at peace; I finally felt that I didn’t have to choose between accepting myself and being a Christian, because I could do both. As I sit here today, after the decision from the United Methodist Church that “the practice of homosexuality is incompatible with Christian teaching” I am crippled. You see, the United Methodist practices I was brought up in were ones that peached love and acceptance, not hate and rejection. I was taught that all are welcome at God’s table. I was taught that loving thy neighbor was of the utmost importance, and was to include all of your neighbors, not only those who identify as heterosexual. 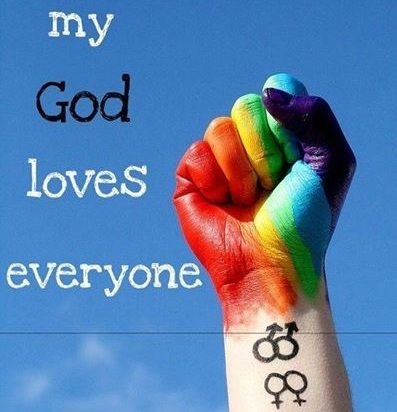 I was taught that God loves all of us, not only those who are cisgender. I was taught to welcome everyone into the church with open arms, regardless of who they love. I was taught that would always rise above hate. However these are not the values and practices that the church is showing to the world right now, quite the opposite in fact. As I move forward on my journey of faith, I will continue to treat people with the love, dignity, compassion, and respect that a true follower of Jesus would, because that is what being a Christian is all about, and I am confident that that is what the God I serve would want. We are your brothers and sisters. We are members of your church family. We are the body of Christ, right by your side. We are no less worthy of the love of God than anyone else. My God loves everyone. I am proud to be gay, now make me proud to be a Christian.